I wish they would also have this for a total bond market fund. It seems like it would be tough to get a bond fund to 0. The reason the stock funds are going to 0 is because securities lending covers the cost, but I don't know if there is as much of a market in that for bonds. FYI, FSITX the total intermediate term bond fund is now at .025 with no minimums so we are getting pretty close. Vanguard will say "this is an indicator of the success of our model". Interesting to see if it will lead to another round of cuts at VG. Also whether people whose 401ks are at Fidelity will see this benefit. I don't have a taxable account yet, but it sounds like I'll have more choices where to open it when the time comes. Does anyone know if SIPC insurance applies to these types of transactions? Are there any provisions to make investors whole if crap hits the fan? Are there any real world examples of this going bad? I agree that it is a risk, but I am wondering how to quantify that. My fidelity 401k doesn't have the 0 funds but my ERs were cut this morning. Now .015 for S&P 500, .025 for bond fund and .045 for Mid caps. So for Total Stock Market about 40% of the return goes to investors who take 100% of the risk. Sweet deal, I'm sure Fidelity is loving this PR!
. . . . . Although I am not sure how Vanguard can respond to this based on their business structure. I am sure Schwab and Ishares will be able to respond. Lowering the minimum investment would be a start . . . it's hard to refer some people to Vanguard as opposed to Schwab/Fidelity when they want to start investing right away but don't have the $3,000 (or $1,000 for TDF) as a barrier to entry. Last edited by KT785 on Wed Aug 01, 2018 12:51 pm, edited 1 time in total. Just watching Fidelity on CNBC now with a more full explanation, including the addition that the "Total Market" fund is a Total US market fund, which is a bit of helpful clarification. Again, every brokerage does this, including Vanguard. If you are an investor at all you have been exposed to this forever. First, I'm quite thankful for Bogleheads to be able to come online and instantly read (and participate in) reactions after I read a news story! Second, does anyone expect any tax implications of owning this Mutual Fund versus a similarly portfolio'd ETF? I don't understand the mechanics fully, but my understanding is that traditionally ETFs are slightly more tax efficient structures. Third, I share everyone's sentiments that I'll be paying close attention to the response from Schwab & Vanguard, as ultimately I don't see a "no response to competition" as sustainable. The only question is how long it would take. Fourth, and this is probably a newbie question: One strong advantage to me of an ETF is that, when I go to sell shares, I have some control over limit orders, timing of the sale during the day, etc. - I haven't traded mutual funds before personally, so are there the same options/controls? I'd be concerned that the benefits of lower ERs could be lost by the loss of ability to be more agile in selling/buying those securities rather than just being stuck with whatever the NAV happens to be at the end of the day. I have exactly the same idea as you. Although I am not sure how Vanguard can respond to this based on their business structure. I am sure Schwab and Ishares will be able to respond. Definitely - there's no reason Schwab shouldn't be able to respond. Vanguard will be interesting. This is pretty genius on Fidelities part. Essentially they offer index funds for free to get everyone over to their platform and charge them for other services. If you have your 401k and IRA with them you might as well do everything else. This really hurts Vanguard because low cost is what they do. It's the only reason anyone does business with them and without any fees... Fidelity already has a better website and UX, and if they have no fees, there is no reason to do business with anyone else. I really appreciate the heads up. Thank you! I was going to make some buys in taxable today but I think now I'll hold off and find out more about these new funds. So will holdings of FSTMX/FSTVX be converted to FROX on 8/3? I completely understand that, but my question about potential insurance protections and what the worst case scenario could be are separate from the prevalence of the practice. Back in the Gus Sauter days Vanguard sometimes beat the index benchmarks through clever trading of options, futures, etc. Haven't checked lately, but I presume all the indexers are wise to those moves today. One reason I like Fidelity over V. is that Fido guarantees if you are hacked that their insurance will cover the loss. I presume there are footnotes that say no recovery if one is totally stupid on protection; V. is less explicit on what their policy is if hacking occurs best I recall, as in, you should follow our security suggestions if you want full recovery. That aside, been with Fido since '83, never any mixups, and service is consistently superb. V. only slightly less so, and I almost always use their ETFs since they are well designed, have low fees, etc. While it is true that lots of places do securities lending, what differs is what proportion of the revenue goes to the fund investors who bear all the risk (how to quantify that risk is a great question to which I do not know the answer). cui bono? Personally, I am more interested to know what Mr. Bogle is thinking right now. I am going to guess he'll most likely say "The Vanguard Effect". If Vanguard responds the same, I will be disappointed. Any chance we can find this info for Schwab? Also, as I understand the Fidelity breakdown what we don't know is how much it cost to run the lending activities on the Fidelity side (the administrative fee is listed as $0 but it is not $0 and is paid by Fidelity). So while only 40% of the income is going to the fund we don't know the cost breakdown in entirety (I think). I'm also seeing that Fidelity has significantly increased the commission free ishares list from about 70 to 240. I bet Schwab will follow with zero-ER ETFs. Race to the bottom here. This is like my supermarket that always has bananas at 49 cents a pound. It's a loss leader hoping to get you to buy higher priced products, or (God Forbid) Advisory Services and AUM fees. I'm sure there will be headlines and Yahoo banners (and banners on all the other sites) with click-bait articles. Last edited by rgs92 on Wed Aug 01, 2018 1:22 pm, edited 3 times in total. The Vanguard article I posted earlier explains the risks (and protections) in detail. I doubt it. This looks like a completely new fund, not a replacement. It looks like you will have to sell shares to get into the new fund or just stop buying FSTMX/FSTVX and buy the new funds instead. I like Fidelity but the only problem is that they have too many funds. You need to drill down to find the hidden gems, like the Freedom Index funds or the good money market ones. They must have over 20 money market funds. It seems like they start a new fund every week. Dodge and Cox they are not. They have all of 6 funds. Last edited by rgs92 on Wed Aug 01, 2018 1:35 pm, edited 1 time in total. You're right about the breakdown. 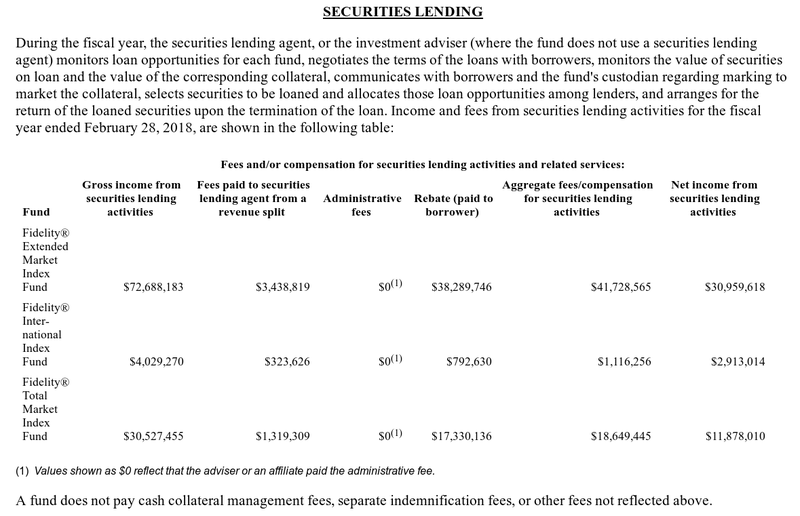 Just in terms of scale though, it's funny that $18.6 million in fees were skimmed from securities lending, while all other total expenses for the entire fund was $14.2 million. I merged several duplicate topics into this first one by jhfenton (the system orders by time). Vanguard does securities lending as well, they just pass the profits to the funds in the form of lower ER, which if you think about it makes these Fidelity 0 ER funds even more impressive. Vanguard is acting transparently; I cannot say the same for Fidelity. Sure. The way securities lending appears to work at Fidelity (using Fidelity Total Stock Market as a guidepost) is that Fidelity takes my investment and buys securities, lends out those securities to others who post collateral for the privilege of having the securities (this is the risky part), and investing the collateral in low-risk investments, with the profits from those investments going to the fund. The low-risk investment in Fidelity's case is the Fidelity Securities Lending Cash Central Fund. However, it's not at all clear what the actual yield on the Fidelity Securities Lending Cash Central Fund is (it was 1.42% as of February 28, the date of the last annual report for Total Stock Market when the 3-month treasury was at 1.65% -- note that the central funds do not charge administrative fees) and how much of that Fidelity takes in pure profit while the risks are borne by those who lend out the securities (us, the investors). Explain what the investor risk is? Is this a new policy or something they've always done? Does only fidelity do this or do others? Per the SAI for Total Stock Market Index Fund (SWTSX), Schwab pays approximately 10% of gross lending revenues in fees to unaffiliated lending agents. No revenue goes to the manager or advisor (Schwab) and all remaining revenue goes directly to the fund. This speaks of securities lending in terms of etfs, and says profits are reinvested in funds and increases performance. Is it different for mutual funds? Here is the video interviewing a representative from Fidelity. You'll enjoy the last question at the end of the video. You seen to have an axe to grind about this. Vanguard acknowledges paying for lending program costs, agent fees and any broker rebates out of their gross securities lending revenue with only the net remaining revenue being returned to the funds per page 4 of this document. "Finally, Vanguard returns all net lending revenues—after subtracting program costs, agent fees, and any broker rebates—back to the funds." In this document they also contend they engage in a lower-risk lower-volume approach to securities lending versus some other entities but do not present any specific financial data to compare their lending practices, gross or net revenue and costs relative to competitors such as Schwab or Fidelity. Interviewer: "Are you tacitly saying that Vanguard has won?" Why do you say I have an axe to grind? Do you mean I'm skeptical of PR and prefer to focus on factual matters? You see that in the TV interview linked above -- the reporters fell for it and overall did not challenge the Fidelity spokesperson. Vanguard of course has to pay all those costs. Fidelity does too. But that is the "Fees paid to lending agent from a revenue split" section which is overall quite small. I also noted what Schwab's arrangement is. No minimum is interesting. I have slightly under $2500 orphaned in a rollover Roth at Fidelity that is currently split between an ETF and cash because of fund minimums. Now I can move it into FPMAX and not have to mess with only buying whole shares. Other than that, while it's a neat trick I don't think the difference between almost zero and actual zero is something to get excited about. You’d think the biggest risk in securities lending is that the short-seller you lent shares to goes bankrupt. Fortunately, industry practice is for borrowers to provide collateral exceeding the value of the loaned securities by a set margin. So while a busted counterparty is a pain, it’s not immediately costly. The costs come in if the borrower is a short-seller (it usually is) and the security that he or she shorted rallies strongly in a single day, the borrower defaults and the provided collateral is insufficient to cover the cost of reacquiring the security. Remember, collateral balances are only settled (at best) daily. Even that is small-fry, however. The real risk with securities lending is that when ETF issuers receive cash collateral, they don’t just sit on it—they put it into money market securities to earn some small amount of interest on the cash. Where firms get into trouble is when these collateral investments go bankrupt, such as when Lehman Brothers went under. It’s unlikely, but it has happened. This is great news. I just logged onto my 401k account at Fidelity. FSKTX was 0.03% last time I checked a few months back. It's now 0.015%. FTIPX was 0.10% last time I checked a few months back. It's now 0.06%. If those expenses drop even further to zero, as the article indicates, this will be incredible for investors. For as sentimental as most of us are towards Vanguard, index funds are commodities. I'll wait a few months then jump ship entirely to Fidelity at zero fees. I see no good reason not to. It doesn't read like Vanguard is doing anything different than Fidelity given they acknowledge paying for lending program costs, agent fees and brokerage rebates out of gross security lending revenue with only the remainder going back to the funds. You seem to try to be making the case that Fidelity is doing something risky or untoward that Vanguard isn't. Interviewer: "There's lots of zeros here. Is this the idea that somebody starts out when they are quite young – they give you, I don't know, a couple hundred bucks, a couple thousand bucks and you think eventually they move on to stuff that actually costs them money?" I just love it when someone starts to step into an obvious trap and then backs out mid-step. Mr. Bogle's crusade is To give ordinary investors a 'fair-shake'. I have little doubt that he is pleased when a good company offers good funds with lower fees. If one wants to speculate about the risks of securities lending, let's pose this question: If Fido lends securities and loses money, not unlike some money market funds that broke the buck and made the investors whole, one could presume--not assured-that corporate Fidelity would make the fund whole to protect its reputation. Vanguard makes a bad deal on securities lending: who pays the tab? There is no slush fund at corporate that I am aware of to tap. Vanguard would have to take it from shareholders of other funds or something. In fact, that has always been a question raised by critics of Vanguard's money market funds. They have been wrong, of course, because V. is a conservative, astute steward. As I said, speculation. Out of all the things in investing I worry about, securities lending is not at the top of the list, and I don't see the point of arguing if Fido's risk is greater than Vanguard's. There's simply not enough evidence on which to base a good judgment. I believe that all the major index fund providers do securities lending to different degrees (ie % of assets lent, % of revenue returned to shareholders, etc). Are you advocating for only staying with funds that return 100% of SL revenue back to shareholders such as Vanguard? You're right, it does read like they are doing similar things. I'm still skeptical. Significantly reduced and simplified pricing on existing Fidelity index mutual funds . . . With this action, 100 percent of Fidelity’s stock and bond index mutual funds and sector ETFs will have total net expenses lower than all of Vanguard’s comparable funds that are available to individuals, advisors and institutional investors. The article also notes $0 fees including wire fees. As the prospectus notes, one of the principal investment strategies is "Lending securities to earn income for the fund." And since the Fidelity TSM fund earns between 4 and 5 bp from securities lending, this is nothing more than marketing. My understanding is that Lending security income is not included in ER. If these funds have a quoted 0% ER then you would add on top of that the income earned from securities lending giving these funds a negative ER. Right, my point is it appears that these Fidelity funds (unlike their other funds) will keep all the security lending revenue. It seems what is lost in all the securities lending talk is that perhaps to compare true cost, one should look at "net ER + returned lending revenue"? If Fidelity charges 0% ER but returns 2 basis points of lending revenue to shareholders, while Vanguard charges 0.04% ER (4 basis points) and returns 7 basis points of lending revenue to shareholders, Vanguard is a better deal, right? What are the actual numbers here to do a comparison? It seems without those actual numbers, it's easy to spin this whatever way you want depending on which company you are working for. Personally, Vanguard still offers several types of funds which I find valuable and Fidelity does not offer: Small cap value index, short-term corporate bond, and ultra-short-term bond. I'm not taking any rash actions yet until a few months from now when it all shakes out. With the reduction in ER on their other index funds, it seems that the investor share class is now the same cost the same as the premium share class for the few funds I checked. Are the ERs the same between the two share classes for all index funds now? They are going to be phasing out the investor and premium classes and just combining them into one MF. Not according to the SEC filing. Where did you get this idea? I was hoping this Fidelity move might lower my FFNOX (Four in One Index Fund) ER, but I just checked and all four index funds are the institutional shares, so not sure if those ER's are going down. The current stated ER for FFNOX is 13 bp, but there is a fee waiver in effect for only 8 bp. I hold the fund in both IRAs and taxable and have since its creation in 1999. Obviously not worth a change in taxable given the capital gains and the auto-rebalancing benefit. Not so in the IRA's, so on Friday I will just consider selling FFNOX and doing my own allocations of the zero funds unless the ER goes down. There doesn't seem to be much difference - in the eyes of a fund owner - between a fund that charges 10bp and gives you an extra 10bp in return from lending revenue, and a fund that doesn't charge an ER in the first place. Fidelity may be making a bet that they can earn more on lending revenue than they can on the ER, especially with additional investors drawn to a zero ER bulking up fund assets. Think of all the people holding ITOT/IXUS, both fee-free at Fidelity, who may be tempted to eliminate the expense ratio entirely by a transfer in their tax-advantaged accounts. Two finance professors wrote a paper speculating that a fund company could juice security lending returns by overweighting stocks that had the most income from securities lending: https://wwwstage2.darden.virginia.edu/u ... Whaley.pdf It's also possible that this is part of Fidelity's plan; the prospectus for the zero-fee funds do mention sampling, but many funds do that, Vanguard funds included, and as mentioned Fidelity is creating their own index (at least partially to avoid fees) but I don't see anything suspect about the index construction. With Fidelity you still get the lending revenue on top of the 0% ER (though there is debate in this thread what percentage of revenue is returned to the fund vs Vanguard/Schwab). So in effect these Fidelity funds will have negative ER.